Shopping for a new Alfa Romeo Stelvio? 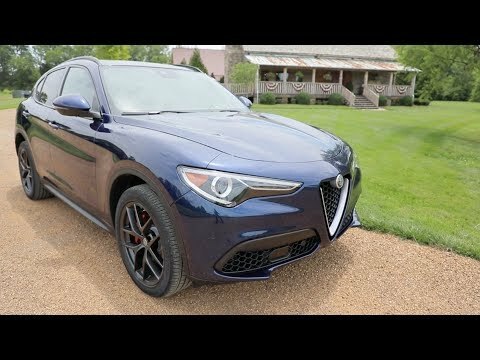 The Stelvio Ti Sport with blind-spot monitors rings up around $48,000 and is the best blend of performance and equipment. Avoid the pricier, $2,200 Rosso Competizione and Trofeo White paint—they look great, but not enough to justify the price. The 2018 Alfa Romeo Stelvio couldn't have arrived soon enough for the fledgling luxury brand. It's the first SUV from the Italian luxury automaker and the one that buyers are most likely to see on the streets, ahead of the Giulia sedan and 4C sports car. Alfa Romeo blends old-world charm with the New World’s obsession with high-riding off-roaders better than names you might also know: Porsche, BMW, Audi, and Mercedes-Benz. It's fair to call the Stelvio a lifted Giulia sedan. The two models share their powertrains, suspensions, brakes, steering setups, most of their interior and exterior design and equipment, and countless other components together. The Stelvio range mirrors the Giulia sedan range on the powertrain front. That means 8-speed automatic transmissions across the board, along with a 2.0-liter, turbocharged inline-4, but the Stelvio distinguishes itself with a standard all-wheel-drive system, even on the Quadrifoglio. This system is relatively lightweight and can send 100 percent of its torque to the rear wheels and up to 60 percent to the fronts. 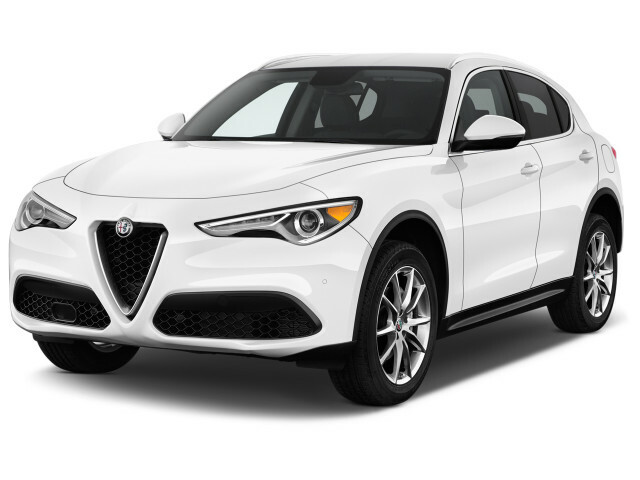 Alfa Romeo engineered a real dancer with the Stelvio, offering very fast steering and a tight, agile suspension. Brilliant paddle shifters, meanwhile, keep drivers engaged (provided they get the Sport Package). The 2018 Stelvio comes standard with a rearview camera, but other safety features require one of the two Driver Assistance packages. Select both, and you’ll get front and rear parking sensors, blind-spot monitoring, adaptive cruise control, forward collision warning with automatic emergency braking, and lane departure warning. In terms of standalone options, keep an eye on Alfa’s larger 8.8-inch infotainment system and the Sport Package. The Stelvio is available in three trim levels, base, Ti, and the high-performance Quadrifoglio (Italian for “four-leaf clover”). On top of those overarching models, there are Sport Packages available for both, while a Lusso (“luxury”) is a late availability item for the Ti. Prices start at $42,990 (including a $995 destination charge) for the least expensive model and will likely extend beyond $75,000 for the Stelvio Quadrifoglio. Alfa says it will announce pricing closer to that model’s on-sale date, during the first quarter of 2018. The Stelvio basically takes the Giulia's styling and puts it on stilts. It wears a virtually identical face to its low-riding cousin. The taller Stelvio wears it better—Alfa's iconic “trilobo” grille looks more natural on the crossover, which can hide the design's visual mass better. The profile looks better than the Giulia’s. The Stelvio's two-box shape leaves designers room to sculpt a scallop-like cut into the back of the greenhouse. It's a gorgeous, organic shape that's a welcome reprieve from the aggressive, angular designs that brands like Lexus offer. In back, a small, steeply raked rear window sits above a heavily styled rear hatch while the rear bumper houses cannon-like exhausts, giving following drivers a good idea of the Stelvio's performance potential. The Stelvio's cabin houses some cheaper components than the competition, but the pieces crucial to driving are both beautiful and excellent to use. The centerpiece is a standard flat-bottomed steering wheel with a thinner rim but ample grips. The stop-start button sits at the 7:30 position of the airbag housing, an inspired touch that looks purposeful and feels very natural to use. Behind the wheel are a must-have set of column-mounted paddle shifters. 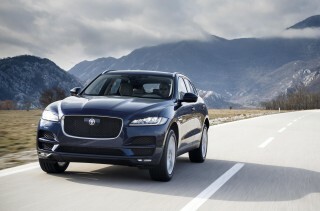 Huge and made of metal, they're a focal point of the Sport trim level. The Stelvio's seats wear leather as standard and have the elegant look you'd expect in a vintage car. The Stelvio Ti gets upgraded hides, while the Sport Package adds huge side bolsters. Designers incised real wood and aluminum trim into the dash, while obvious plastics are kept to a minimum. Overall, this cabin is a lovely place to spend a long drive. The Stelvio's two-engine lineup mirrors the Giulia. 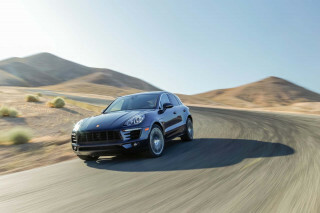 A 2.0-liter turbo-4 builds 280 horsepower and 306 pound-feet of torque in base and Ti models. 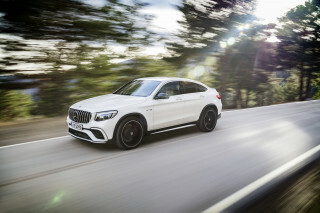 This engine should keep Mercedes-Benz GLC-Class, BMW X3, and Audi Q5 owners up at night. There's only a little hyperbole at work there. 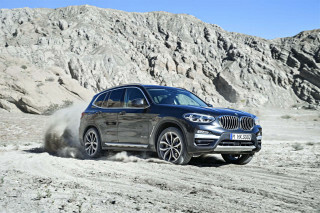 The turbo-4 outguns the base engines in the BMW X3, Mercedes-Benz GLC300, and Audi Q5, while it has enough grunt to hold its own against the X3 and Q5's optional V-6 powertrains. Performance is strong from a standstill and up through redline, with the broad, flat torque curve kicking the nearly 4,000-pound crossover in the pants whenever it's necessary. The Stelvio can hit 60 faster than any other base model in the segment, arriving there in 5.4 seconds before hitting a 144-mph top speed. The 2.0-liter's partner in crime is ZF's fantastic 8-speed automatic transmission. It's an unobtrusive transmission when the DNA drive mode selector is in Natural, kicking down as needed and holding gears where appropriate. It's good in Advanced Efficiency, short-shifting along to save fuel. The transmission's potential comes to full life in Dynamic mode. Shifts are fast and almost brutally hard. It's unlike any other SUV we've driven, with high-rpm gear changes delivering a swift kick in the back. The changes are smooth and quick on downshifts, so don't be surprised if, like us, you start using manual mode just for giggles. The Stelvio isn't some automotive fullback, capable of only running in a straight line. It's a four-wheeled ballerina. This is one of the most agile, enjoyable vehicles in its segment, easily matching up with the sublime handling of the Jaguar F-Pace. A perfect 50-50 weight distribution ensures a wonderful balance and a neutral handling character that's willing to rotate if you drive it properly. The Stelvio is good in Ti Sport form, but the upcoming adaptive suspension and mechanical limited-slip differential in the Ti Performance Package should deliver even sharper handling when they arrive later this year. Divine steering intervenes on the Stelvio's behalf. Lightning-fast with an 12.0:1 steering ratio and exceptionally precise, the steering feels natural and builds weight well. It's very talkative, giving drivers a clear idea of what the front axle is doing. Feedback in general is excellent through the seats. It doesn’t track all that well at highway speeds and can get tiring, but the trade-off in the bends is worth it. We’ll level some criticism at the Stelvio's brakes. Alfa Romeo uses an all-electric brake pedal that records input and transmits it to a computer, which directs the action of the brake calipers. It's a fantastic system in high- or medium-speed, dynamic conditions. It's also virtually impossible to stop the Stelvio smoothly at the sort of speeds you'll encounter in high-traffic areas. The Alfa Stelvio commits a couple of sins on its way to SUV divinity. We’d still rather hang with the sinners. In the Stelvio, excellent optional front seats offer plenty of support and some leather, real wood and aluminum trim hit grace notes. None of those make up for a cramped second row, a smallish cargo hold, and an overarching sense of cheapness throughout the interior. Alfa Romeo offers three different seating options on the Stelvio—while leather is standard, Ti Sports get more heavily bolstered chairs and the Ti Lusso scores more luxurious hides. Those with broader frames might not care for the super supportive Sport seats, but if you plan on tackling twisty roads regularly, they're the only way to fly. 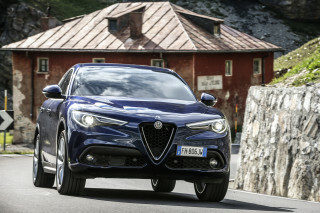 The rest of the Stelvio's cabin is a mixed bag. Real wood trim—Dark Gray Oak—is standard on Ti models, while the Lusso gets an optional Light Walnut. The Ti Sport is available with real aluminum. Along with the leather dash, there's a lot to like here. But none of it feels very solid, and while the plastics are technically soft touch, they're weirdly firm, too. The hard black plastic surrounding the shift lever and controls for the infotainment system also feels out of place. We question how well this cabin will hold up to more than a few years of use. 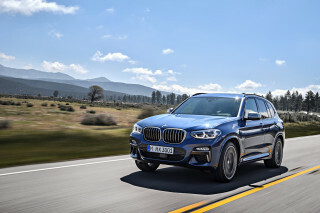 Second-row leg room should be fine for children, but with just 31.9 inches—over 4.5 inches less than the next closest European crossover, the BMW X3—adults will want to avoid the back seats on all but the shortest of journeys. Head room is tight too, although at 38.9 inches in back, the Stelvio sits neatly between the Mercedes GLC on the low end and the BMW X3 and Audi Q5 on the high end. The Stelvio has merely average cargo space, with 18.5 cubic feet of cargo space behind the second row and up to 56.5 cubic feet in total. 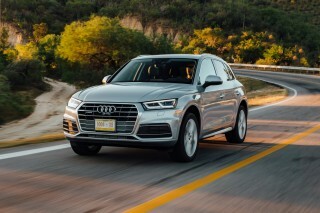 That trails behind the new Audi Q5 (26.8 cubic feet with 60.4 in total) and the BMW X3 (27.6 cubic feet and 63.3 in total), although the Stelvio's maximum ties the Mercedes-Benz GLC-Class. All Stelvios are available with active safety systems like forward-collision warnings with automatic emergency braking, adaptive cruise control, lane-departure warnings, and blind-spot monitors. 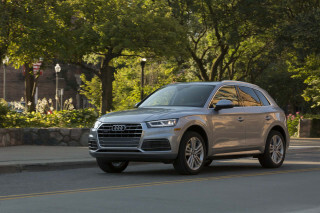 Most of these features are in one of two packages—a $650 Driver Assistance Static package adds blind-spot monitors, while the $1,500 Driver Assistance Dynamic Plus adds the rest. A rearview camera with rear parking sensors is standard on all models. The Ti trim adds $2,000 to the price tag and brings with it wood trim, heated leather seats, an 8.8-inch infotainment system, SiriusXM satellite radio, 19-inch wheels, and front parking sensors. Option packages are relatively simple. Base Stelvio owners can add the $1,800 Sport Package and get 19-inch alloys, a sport-tuned suspension, gloss-black window surrounds, a sportier steering wheel, and those gorgeous paddle shifters. A Driver Assistance Static Package costs $800 and adds blind-spot monitors, front and rear parking sensors, and auto-dimming mirrors. Advanced safety equipment is available in the Driver Assistance Dynamic Plus Package that adds adaptive cruise control, automatic high beams, forward-collision warnings with automatic emergency braking, and lane-departure warnings. Finally, a $795 Cold Weather Package adds heated front seats, a heated steering wheel, and heated washer nozzles. Stand-alone equipment on the base Stelvio includes navigation for the 6.5-inch infotainment system and the upgraded 8.8-inch display. The Stelvio Ti ups the ante with plenty of extra options, including the mutually exclusive Sport and Lusso packages. The Sport Package costs $2,500 and adds all the same equipment as the base Stelvio plus sport seats and 20-inch wheels. The Lusso Package adds upgraded leather on the seats and steering wheel, a leather-wrapped dash, and wood trim. The Ti Performance Package is available on non-Sport models and adds an active suspension, mechanical limited-slip differential, and column-mounted paddle shifters. The same package is available for the Ti Sport, sans the already included paddle shifters. Alfa Romeo will announce pricing for these packages later this year. This all sounds good. It does not, however, address Alfa Romeo's reputation for reliability (or lack thereof). Alfa offers a 4-year, 50,000-mile warranty on the Stelvio. A 5-year, 100,000-mile warranty covers the powertrain, while the first service is free. It’s better than most mainstream cars, but far behind the free-maintenance offers you’ll get on an F-Pace or an XT5. 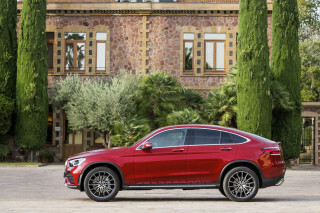 In terms of fuel-sipping technology, the Advanced Efficiency driving mode, a recalcitrant stop-start system, and the 8-speed automatic transmission are about as good as the Stelvio gets. Looking for a different year of the Alfa Romeo Stelvio?